Journeys of heart and mind: Who moved our spacecraft? Some spacecraft have trajectories that are slightly unexpected. Something has speeded them up or slowed them down - but what? Current methods of analysing and predicting spacecraft behaviour involve many factors, but the figures just don't add up. Something strange and unexpected is going on. The major factors that affect spacecraft motion are gravity and rocket propulsion. Spacecraft and indeed all bodies in the solar system, from dust grains right up to the the largest planet Jupiter, move through a complex gravity field. Each body is tugged upon by every other, and the strength of pull depends on the masses involved. The mathematics is very complex and for more than two bodies involves iteration. The second major factor comes into play whenever a manoevering engine is fired, this clearly changes the trajectory (which is the purpose of the engine of course). The velocity of a spacecraft can be measured very accurately by examining its radio signals. Changes in velocity cause a change in frequency. But the calculated trajectories don't always match up with the measured ones. There are many other subtle factors that affect a spacecraft. Pressure from solar radiation, loss of gas from the spacecraft's systems, impact by small particles, relativity effects, loss of speed due to passing through the outermost fringes of a planetary atmosphere, magnetic and electrostatic fields, and more. But effects such as these are quite well known and can be allowed for. Yet the figures still don't quite add up. And nobody knows why. The effect was first noticed decades ago as the Pioneer probes passed into the outer Solar System. They were travelling ever so slightly slower than they should have been. At the time this didn't cause much surprise, it was put down to some minor effect that nobody could identify and, like all these effects, it was far too small to affect the mission. Several possibilities were discussed at the time, none of them were accepted enthusiastically. But it's happened again, and again, and again with other spacecraft. At last a pattern is beginning to emerge. 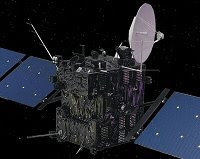 All the affected spacecraft have made close planetary passes to help shape their trajectory (gravity assists), while other spacecraft have not been affected. John D Anderson, Curator of Aerodynamics at the National Air and Space Museum in the USA, has been looking very carefully at the evidence. Anderson and others working with him have now come up with a mathematical formula which may enable them to predict the size and direction of the effect, it seems to work for all the effects seen in past spaceflights and they're waiting with bated breath to see if it accurately predicts the effect for Rosetta as it made its second fly-by of Earth last November (they haven't seen the data yet). There's another opportunity in November 2009. (John Anderson's scientific paper is "Anomolous orbital-energy changes observed during spaceflight fly-bys of Earth", John Anderson et al., Physical Review Letters, Vol 100, p 091102. There's also a report in New Scientist, 20th September 2008, pp 38-41). All of this is quite fascinating, both to spacecraft engineers and to physicists; it really does seem as if something may be slightly wrong with our theory of gravity or there's some other effect at work that we are not yet aware of. Either way, prepare for a major new discovery in physics. But either way, don't hold your breath. Finding the underlying mechanism could take quite some time (years or decades, perhaps even longer).